When Will Steph Curry return? Who will win the battle between defense and offense in Houston and Salt Lake City? The West's semifinals are littered with big questions. Three of the four teams who made last year’s Western Conference semifinals are back in action this season, as the Warriors, Rockets and Jazz will be joined by the fresh-faced Pelicans. The talent will be off the charts in the second round of the playoffs, as Kevin Durant, James Harden, Anthony Davis and perhaps Stephen Curry, arguably four of the top five players in the world right now, will all be on display. The Rockets and Warriors were expected to be here, and both teams faced only small speed bumps before advancing. The Pelicans are the surprise team of the playoffs. It wasn’t shocking to see New Orleans win its series over Portland, but the Pelicans’ dominant sweep certainly raised some eyebrows. Meanwhile, the Jazz knocked out the Thunder on the strength of Donovan Mitchell’s scoring and Rudy Gobert’s defense. Even after losing Gordon Hayward, the future is bright in Utah. The stakes will only get higher as the games progress in the postseason. Here’s what to be on the lookout for in the West semis. Most Intriguing Storyline: When Will Curry Returns to Form? Curry is officially listed as questionable for Game 1 of the Warriors-Pelicans series, and it appears he’ll be returning from his knee sprain sooner rather than later. The less effective Curry is, the more beatable the Warriors become. Golden State doesn’t seem to be in any rush to throw Steph on the court, but the Pelicans should be a much firmer challenge than the Spurs offered in the first round. Curry’s importance to this team, even one with three other All-Stars, can’t be overstated. The Warriors had a pedestrian 0.7 net rating with Curry off the floor during the regular season. They had a 13.7 net rating with Curry playing, including a laughable 122.8 offensive rating. If Curry looks like MVP Curry when he hits the court, the Warriors again immediately become runaway favorites to win it all. If it takes Steph a few games to adjust, the Pelicans have a much better chance of pulling off a massive upset. Essentially, the health of Curry’s knee will decide if we see the historically significant, take-no-prisoners version of the Warriors, or simply the great-team-that’s-still-vulnerable version. That’s a lot of pressure riding on one body part. The Jazz vs. Rockets series is a classic matchup. The league’s best offense vs. the league’s best defense. Utah went on a tear with Gobert in the lineup over the second half of the season. After the All-Star break, it was actually the Jazz who had the best net rating in the NBA. Gobert’s dominance was profoundly evident during Utah’s series against the Thunder. Players simply don’t want to enter the paint when Gobert is lurking under the rim, and when they do, the results are often poor. Houston, of course, presents challenges for any defense. Will Gobert be forced to switch onto James Harden or Chris Paul in pick-and-rolls? Can Gobert hold up if he’s playing in space as opposed to under the basket? The Jazz typically start a big frontcourt, but I’m not sure this is the right series for Derrick Favors at power forward. The contrast of styles in this series means each game should be a fight to see who establishes their identity first. If Gobert can be as effective as he was in Round 1, the Jazz become much more dangerous. If Harden is routinely abusing him on switches—as he’s done to centers all season—than the Jazz’s best player can be schemed to ineffectiveness. (1) Houston Rockets vs. (5) Utah Jazz: Can Donovan Mitchell Keep Doing This? Donovan Mitchell is absurd. The rookie is averaging 28.5 points per game through his first six playoff games, and he outplayed both Russell Westbrook and Paul George in the first round. Re-read that last sentence, and imagine what you would have thought if someone told you that would happen last July. In the Jazz’s Game 6 win over the Thunder, Mitchell scored 38 points, including 20 in the third quarter alone. His 38 points in a closeout game were the fourth-most by a rookie in NBA history, trailing only Magic Johnson, Lew Alcindor and WIlt Chamberlain, according to ESPN. Mitchell’s offensive game is incredibly mature. He attacks switches with a Harden-esque flair, and he has supreme confidence in his three-point shot. Mitchell never quite seems to be forcing his offense, and unlike other gunners, his shooting confidence is based largely on him still being able to play efficiently. Mitchell alone won’t be able to go toe-to-toe with Houston’s offense. But if Utah can slow the game down, then Mitchell could potentially steal them some wins. The Rockets are going to be substantial favorites in this series, and even if they cruise to a victory, we should enjoy Mitchell’s first postseason run for as long as we can. 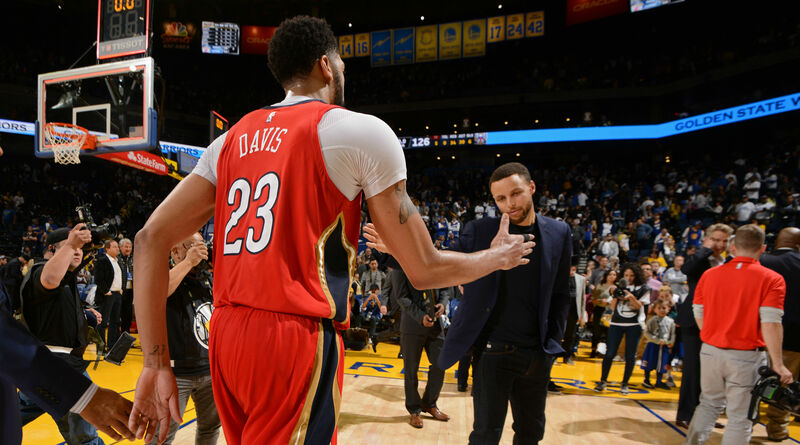 (2) Golden State Warriors vs. (6) New Orleans Pelicans: Will Anthony Davis Be the Best Player on the Floor? After missing the postseason last year, Anthony Davis was hellbent on making the playoffs in 2018. When DeMarcus Cousins tore his Achilles, Davis put together one of the ultimate team-on-his-back performances down the stretch of the regular season, forcing himself into the MVP conversation as he carried the Pelicans into the playoffs. His dominance continued in the first round, as Davis was a two-way monster against the Blazers. New Orleans had an 11.7 net rating with AD on the court against Portland. Lineups with him at center were practically unstoppable, as Davis gamely protected the rim on defense while devastatingly operated in space on the other end. If The Brow keeps up his level of play against the Warriors, the series becomes a lot more intriguing, especially if Curry takes a couple games to get going. Both teams will spend most of their time playing small, and Davis will be a tough cover even for great defenders like Draymond Green and Kevin Durant. The extra attention on AD will open up shooting opportunities for Nikola Mirotic and Jrue Holiday, who’ve been feasting on open looks in the playoffs. If Davis continues to make himself unguardable, then the Pelicans inch that much closer in top-end talent to the most talented team in the league. Of course, Davis won’t be able to do it alone, which means the Pelicans’ supporting cast will need to have a huge series as well. And it’s when you start comparing the depth between the two teams things get dicey.